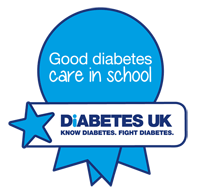 Congratulations to the Good Diabetes Care in School Award holders in Northern Ireland, Diabetes UK officially recognises that these schools deliver effective diabetes care and management. View the winning schools in Northen Ireland below, and to view the national winners go to ourhonour wall. Our daughter is very involved in school life. She is a member of the choir and orchestra, which are both after school activities. She has never felt excluded or discouraged from taking part in any activity. The school is very easy to approach and help when possible." We believe that the school ha embraced all aspects of our child's diabetes care, enabling him to experience and fulfil the same educational opportunities as his peers. The staff have allowed children to develop own skills and changed from a proactive to a supportive role. There is one to one classroom assistant support for both students with Type 1 diabetes. The school has always given me their full support with my child's diabetes care. From day one, the staff were keen to learn and willing to be fully trained in all aspects of care for my child. The school has been overall supportive to the child and her family in all aspects of her diabetes care. They were so keen to take on the diabetes training when she first went to school and this has continued throughout her years at school. They have always ensured that her diabetes does not prevent her from participating in all her school activities. She is in no way made to feel different from her parents. The best thing Ashgrove has done for my son is gaining the knowledge they need to care for him and going our of their way to do this. The whole school staff have enabled the student to test in his classroom and promoted his developing independence while continuing to support him. Very supportive to the child and family, ensuring all things are in place to support them whilst at school. Good communication between schools and family and ourselves if needed. The school wants to be involved. They take a very active interest in her - want to be involved in educating themselves on diabetes. They ensure my daughter is never left out or singled out because of her diabetes. This is a school that goes the extra mile to ensure that a child with diabetes take part in the complete school curriculum and any extra curricular activity the school offers. We are grateful to the school that our son can trust other people to look after him in school, so he can lead as normal life as possible without looking to his parents all the time. The school readily agreed to take on this role and embraced the training I provided. The pupil is very happy with this arrangement, as are his parents. It has meant that Mum has been able to return to work. The school ensured that she could do everything she wanted to do in school in terms of opportunities to go on trips and participate in extra-curricular activities. Supporting child and family in all aspects of school life. Communicating with all levels of staff as necessary.